Maundy Thursday marks the beginning of the Triduum, the last three days of Holy Week, in which our worship flows in one continuous liturgy, beginning with the Maundy Thursday service. “Time is suspended as we ponder and celebrate the great mysteries of our redemption.” The word “Maundy” is derived from Middle English, Old French and from the Latin word mandatum, meaning “commandment,” the first word of the phrase “Mandatum novum do vobis ut diligatis invicem sicut dilexi vos” (“A new commandment I give unto you, That ye love one another, as I have loved you”), the statement we hear from Jesus to his disciples in tonight’s gospel reading. The bulletin is here. The description of Holy Thursday with the Bible readings and commentaries is here. A photo gallery of the service can be found here. We had 17 in the service compared to 21 the year before. The sermon is here. The sermon comprised two stories – one which just happened was a celebration of Maundy Thursday. Catherine brought many boxes of pizza to the trailer court. They reviewed Maundy Thursday and had foot washings. One girl asked if they could do it again tomorrow. The second was from Winter/Spring edition of Bostonia, the alumni magazine of Boston University. "The title of the article is “Street Doctor,” by Barbara Moran. It was about a doctor who wanted to go into oncology. However, he went to a street clinic. The Nurse"took away his stethoscope, and told him to go soak the patients’ feet in the waiting room. She said, “This is not about doctoring….it’s about getting to know people.” And so Jim soaked feet. He soon realized how extraordinary the work was, because “it reversed the power structure.” It put him at the feet of the people that he was taking care of—he would say hello and soak their feet, and some of them would say hello back, and some of them wouldn’t. But over time, almost everyone started talking with him, and he realized that being present and consistent gave the people a chance to open up. "Jesus spent his entire life on earth reversing power structures through the things he did—eating with sinners, casting out demons, courageously speaking up and demanding that those in authority in the temple eliminate the destructive corruption that was destroying the temple. "On that last night with his disciples, Jesus took away the “stethoscopes” of the disciples. As he washed their feet, he showed them, through his actions, that they wouldn’t need power, or prestige, or recognition, or wealth to be his disciples. They wouldn’t need to distance themselves from one another through a hierarchy. Not one of them needed to be first." 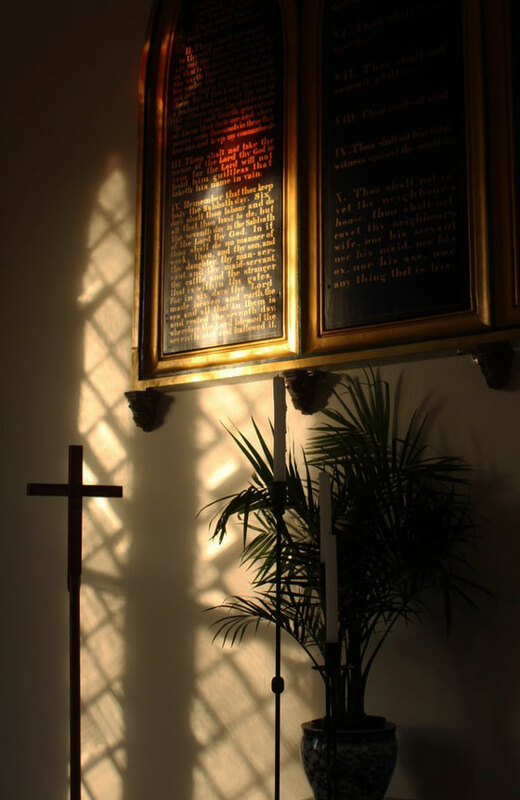 Of note in the service was the choice of hymns – "What wondrous love is this","As in that upper room", "In remembrance of me", "Stay with Me", "O Lord, hear my prayer." The Maundy Thursday set of hymns is very rich. Maundy Thursday was both a celebration of those times with friends but also acknowledgment that things would end quickly. The disciples did not always understand. At the Last Supper Jesus would be a server and servant – of the bread and wine and also washing feet and encourage the others to do the same. This was the worst – washing feet caked with dirt and grime made worse by the sandles they word. He was acting as a lowly servant so that they would understand the necessity to serve. By this action Jesus would show God’s love and they would show it others also. " You call me Teacher and Lord–and you are right, for that is what I am. So if I, your Lord and Teacher, have washed your feet, you also ought to wash one another’s feet. For I have set you an example, that you also should do as I have done to you. Very truly, I tell you, servants are not greater than their master, nor are messengers greater than the one who sent them. If you know these things, you are blessed if you do them." The foot washing this year emphasized the above portion of the Gospel. Usually the priest washes the parishioners’ feet. 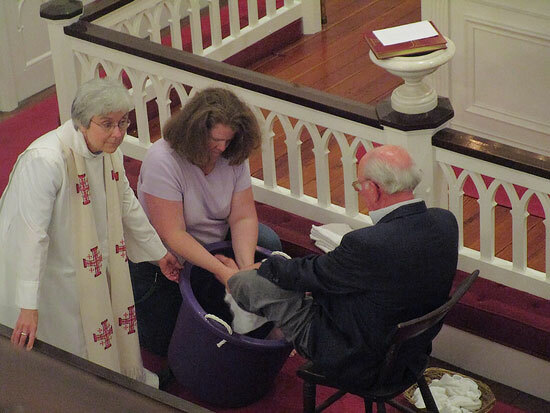 This year Catherine washed Betty’s feet and then she washed another parishioner. And so it went forward.. He provided them a new expanded commandment of love one another – "I give you a new commandment, that you love one another. Just as I have loved you, you also should love one another. By this everyone will know that you are my disciples, if you have love for one another." This would be through prayer, care and action. This love is the Agape love where we provide for the well being of others. Love is transformed into giving and receiving for all including the sinner and tax collector. It is not just between friends but includes enemies. Maundy Thursday is known for the stripping of the altar which is part of the preparation for Good Friday. After the Last Supper, less than 24 hours remained for Jesus. Indeed the plotters had to execute him before Jewish passover began on Friday evening at sundown. Our altar was stripped with the repeated singing of "Stay with Me" representing Jesus praying in Gethsemane before he was arrested. Events moved rapidly – prayer in Gethsemane, betrayal by Judas, arrest, mock trial, painful beating, the trudge to Golgotha and execution. As His life was stripped from Him, so we strip our altar of the signs of life to symbolize His purposeful, redemptive suffering and death for us. The candles are extinguished and removed. 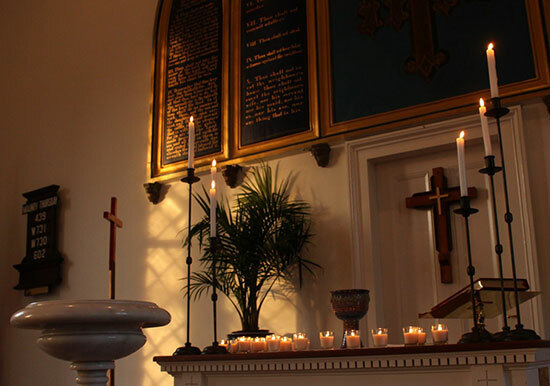 Candles represent the "Light of the World" Jesus said; "I Am the light of the World" in recognition of the darkness following the death of Jesus on the cross, the candles are removed from our presence. We did have a period of silent prayer at the end with music medication in remembrance of Jesus time of prayer on the Mount of Olives and in solidarity with all who seek strength in time of prayer. The music was provided by Catherine on piano.